George Graham Reviews The String Cheese Incident's "Carnival 99"
The Grateful Dead had remarkable staying power through their nearly 30-year career, based mainly on their live shows, which relied on extended improvisational jams, and interaction with the audience, such that the Dead's concerts were more than shows, but were true 1960s happenings on into the 1990s. The Dead attracted generations of audiences, and had a surprising number of younger fans who were very much into the scene the Dead created, in both good ways and bad. Even while the Grateful Dead were still performing, younger bands were starting to follow in their footsteps with a combination of extended jams and concerts whose atmosphere and audience created more of a similar kind of "happening." Rusted Root have become the kind of quintessential young "hippie" band, and since the death of Jerry Garcia, the New England-based group Phish have essentially inherited the mantle of the Grateful Dead, with all the musical and atmospheric trappings, attracting the same kind of audience loyalty with fans who follow the group from tour stop to tour stop, and are attracted almost as much by what happens among the audience as by the stage antics of the group. One of the interesting aspects about the new generation of jamming bands is that the musicianship is generally at a higher level than it was back in the Sixties. And among the passel of new jam bands, some of the best playing of all can be heard from a Colorado quintet, with the appropriately psychedelic name, The String Cheese Incident. 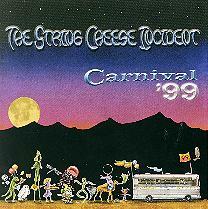 The group has just released a double CD of live performances from last year called Carnival '99. The String Cheese Incident was formed in 1993 in a Colorado ski resort town, though they eventually moved to Boulder where they have been based. The group prides itself on its eclecticism, moving easily, and often with remarkable speed, between electrified bluegrass, jazz, fusion, Latin, African-influenced and country. The bluegrass facet comes mainly from Michael Kang, whose main instrument is the mandolin, though often electrified, and the fiddle. The guitarist, Bill Nershi sticks with the acoustic variety, though it is amplified. The rest of the group are Kyle Hollingsworth on keyboards -- generally avoiding synthesizer sounds, and concentrating on piano and Hammond organ -- bassist Keith Moseley and drummer/percussionist Michael Travis. All are excellent players, and they have a great degree of musical communication that makes their extended improvisations quite impressive. This is one jam band who can play on and on and still remain interesting. Their combination of fine playing, eclecticism and interaction with their audience prompted me to give their previous live album A String Cheese Incident our Graham Award for favorite album of 1998. While being based mainly in the West and Rocky Mountain States, The String Cheese Incident have already developed a considerable national following with relentless touring; and like the Grateful Dead, they have fans who follow them around. So to accommodate them, this independent group who release their records on their own label, have formed their own ticket and travel agencies. They also do occasional international shows and bring along planeloads of fans. Carnival '99 is a generous collection of music, running about two hours and ten minutes, recorded at 11 different locations from Philadelphia to San Francisco during a tour in the winter and spring of 1999. And again, the group proves its musical mettle with a combination of original material with covers ranging from bluegrass pioneer Jimmy Martin, to fusion compositions by Weather Report and Jean-Luc Ponty, to a tune by the New Orleans R&B group The Meters, to the jazz classic Take Five. As usual, most of the material is instrumental. Vocals are not The String Cheese Incident's strong point, nor are their lyrics very profound, but these guys can really play, and play well together. The String Cheese Incident is one of the very best of today's generation of jam bands. They combine a superb level of musicianship with a kind of playful eclecticism, along with a great ability to engage their audience to make music that's both fun to listen to and musically interesting. They capture the spirit of the psychedelic bands but make music that stands up to close, sober scrutiny. This is one band that can jam on a tune for 15 minutes and not get boring, while during that period change styles and musical directions three or four times. Their new double CD Carnival '99 provides a generous two-hour helping of the band in their element, live before enthusiastic audiences. While the group might have been able to edit it down to a single CD, be a bit more succinct by just including the strongest material, their growing number of fans will likely appreciate the breadth of Carnival '99. In terms of sound quality, the CD is good for a live recording: the sound is generally clean and unfettered by too much processing in the mix, and there is good sonic continuity among the recordings from the various venues from which these performances were taken. While Phish and Rusted Root have attracted some of the Grateful Dead's fans, The String Cheese Incident provides the requisite musical atmosphere along with consistently worthwhile and downright impressive music.